Sabrina & Joey… oh wait, perhaps ABC Family got a little confused this Halloween, or maybe the writers of Melissa & Joey were having a lot of fun as they put together the Halloween episode that entertained fans this week, complete with a guest appearance by Beth Broderick. Melissa & Joey is a sitcom that often gets overlooked, perhaps because it is off the mainstream network path, but ABC Family has several quality family programs on their hands, and Melissa & Joey may well be the strongest and most entertaining of their sitcoms. With a variety of ABC Family’s programs offering up special Christmas themed episodes this year, Melissa & Joey opted for a Halloween themed one, and turning back to Melissa Joan Hart’s teenage roots as a witch on Sabrina the Teenage Witch was an excellent choice. In the past they have danced, reminding fans of both Melissa and Joey Lawrence of their turns on Dancing With The Stars, and Joey’s trademark “whoa” (from Blossom) even popped out in the Halloween episode. This entry was posted in Television and tagged ABC Family, Beth Broderick, Blossom, Dancing With The Stars, DWTS, Halloween, Joey Lawrence, Melissa & Joey, Melissa and Joey, Melissa Joan Hart, Sabrina, Sabrina the Teenage Witch, witch on October 23, 2014 by Kay. Probably since the dawn of television program scheduling the infamous powers-that-be have been trying to decide how to pair television shows. Oversimplifying the problem/question, each season as they plot it out, they are trying to decide whether they want a block of shows they feel naturally fit together, where the audience for one show is an “obvious” for the next, or if they want to pair shows that are at first glance about as far from a match made in heaven as an audience member can imagine, and yet, when you get tempted by that teaser scene into staying tuned into the next show, suddenly you discover a new favorite show you might otherwise have never found on the schedule. CBS putting NCIS back to back with NCIS: Los Angeles in previous seasons, and NCIS: New Orleans this season is a prime example of that seemingly obvious and natural fit. The hope is, if you like one NCIS show, you like all NCIS shows. In contrast, there are many who wondered at the pairing of Blue Bloods with Hawaii Five-O. A match-up that as succeeded for several seasons now. Perhaps it is the nostalgia factor of Hawaii Five-O that leads some to also like a Tom Selleck led show. Or maybe audience members who like one cop show on an island (Hawaii) like another cop show on an island (Manhattan). Whatever the magic is (two strong family/community-centric shows? ), the majority of the audience from Hawaii Five-O appears to stay where they are for another hour and follow the Reagan family as they keep New York safe in Blue Bloods. 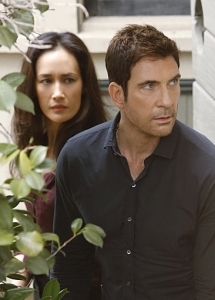 When it comes to Wednesday nights on CBS one can not help but think that Stalker is benefiting from having been slotted in after Criminal Minds. Both shows are intense rides and with 9 seasons under their belt Criminal Minds has shown not only that they know what they are doing, but they are skilled at bringing characters in and out of the fold. New this season, Stalker follows a Threat Assessment Unit (TAU) as opposed to the Behavioral Analysis Unit (BAU) of Criminal Minds, but the characters are equally determined to protect the victims, hunt down the bad guys, and keep people safe. In some respects, Stalker and Criminal Minds might have been placed together on the schedule as a combination of both theories… they would attract the same audience, and yet there may have been a fear that Stalker was not getting enough advance attention and promotion for the Criminal Minds audience and fan base to find the show. If Morgan (Shemar Moore), Reed (Matthew Gray Gubler) and Garcia (Kirsten Vangsness) from Criminal Minds were to help the TAU out on a case or two on Stalker the show might not only get a bump in the ratings, but keep those extra audience members as they discover what they have been missing out on. This entry was posted in Television and tagged A.J. Cook, Blue Bloods, Criminal Minds, Dylan McDermott, Elisabeth Röhm, Hawaii 5-0, Hawaii Five-0, Hawaii Five-O, Jennifer Love Hewitt, Joe Mantegna, Kirsten Vangsness, Maggie Q, Mariana Klaveno, Matthew Gray Gubler, NCIS, NCIS: LA, NCIS: Los Angeles, NCIS: NO, NCIS:LA, NCIS:New Orleans, NCIS:NO, Reagan, Shemar Moore, Stalker, Tom Selleck, Victor Rasuk on October 22, 2014 by Kay. It is hard to say what the most anticipated show of any television season is, even if you narrow it down to a network or genre, but while many were talking about FOX’s Gotham, lovers of the super-hero were also eagerly awaiting the arrival of the CW’s Flash. Gotham was the subject of a great deal of conversation and buzz in large part because so little was truly known before the first episode was aired. Bruno Heller is a name in television, in so much as he is the man behind Patrick Jane and the Mentalist, but that is to the eyes of many a show of a different genre and thus could fans rely use that show to judge what they would be getting in Gotham? The Flash on the other hand had several advantages. Not only is it coming from the same production team behind Arrow, but Barry Allen (Grant Gustin) appeared in two episodes of Arrow which laid the groundwork for The Flash. The episodes were not created to feel like a backdoor pilot, but rather introduced Barry Allen as a character that most of the audience knew, or suspected, would have a show of his own in the coming season and was worth paying that extra little bit of attention to. So far the audience has gotten to know Barry Allen’s work life, and Detective Joe West (Jesse L. Martin) who raised him and is now the cop he works with most often. His personal life, or what there is of it, in the form of his one true friend, and psuedo foster-sister, Iris West (Candice Patton) who is in College studying journalism, and the S.T.A.R. Labs team who stabilized Barry while he was in a coma and is now helping him to find other meta-humans and make sure the accidents consequences aren’t more than Central City can handle. At S.T.A.R. Labs, the equivalent of The Flash’s Arrow Cave, Barry is working with Caitlin Snow (Danielle Panabaker), Cisco Ramon (Carlos Valdes), and the hard to decipher and trust, Harrison Wells (Tom Cavanagh) who was the director of S.T.A.R. Labs when everything went up in smoke. With the introduction of Ronnie Raymond, not only are fans getting a glimpse of Caitlin Snow before the accident, but we are also getting our first addition to the show, a recurring character who will be introduced in a manner where it feels from the start that he is meant to be here, meant to be a part of the world and the audience is intended to want him to survive and recur. No offense to Chad Rook who played Clyde Mardon in the pilot, but his evil self was there for our hero to battle and conquer, much as Michael Smith’s Danton Black, aka Multiplex, was in the second episode for The Flash to discover the hero within and just what he was capable of. Neither of those characters felt like integral parts of The Flash’s world, but rather stepping stones the plot and characters needed to keep us moving forward. Where some shows need an entire season to lay the foundation before they can start digging deep, it appears with episode three The Flash is ready to dive in and start giving fans the good, the bad, and the back-story. This entry was posted in Television and tagged Arrow, Barry Allen, Caitlin Snow, Candice Patton, Carlos Valdes, Chad Rook, Cisco Ramon, Clyde Mardon, CW, Danielle Panabaker, Danton Black, Detective Joe West, Eddie Thawne, Firestorm, Flash, FOX, Gotham, Grant Gustin, Harrison Wells, Iris West, Jesse L. Martin, Joe West, Michael Smith, Multiplex, Rick Cosnett, Robbie Amell, Ronnie Raymond, S.T.A.R. Labs, STAR Labs, Stephen Amell, The Flash, Tom Cavanagh on October 21, 2014 by Kay. Season 6 of the CBS show The Mentalist brought a new status quo. Finally free of the Red John serial killer that had in many ways weighed down the show, Patrick Jane (Simon Baker) was now with the FBI instead of the CBI (California Bureau of Investigation) and with the entire country to dabble in, new and hopefully more interesting cases, and part of a new team with a few familiar faces, he was able to back to the original antics that made the early episodes so much fun. The DVD for The Mentalist The Complete Sixth Season includes an interesting featurette in which members of the cast and production talk about both the mythology of Red John, and Patrick Jane, as they put it, Redeemed, Recovered and Restored. For me that was particularly interesting, and gave me a better understanding of the minds behind the show, and a fundamental difference of opinions they and I have had for the past six seasons. They viewed Red John as Patrick Jane’s great white whale. The serial killer was the foe he would go to the ends of the earth to find and slay. For me, Red John was the catalyst of the show. as I recall the pilot and the premise, losing his family to Red John sparked a transformation in Patrick Jane at some level. While one can not say it changed him entirely as a man, it prompted him to be a better man. He joined the CBI, and instead of being a con-man psychic he started using his gifts and powers of observation for good. Instead of doing things that either qualified as committing crimes, or walking very near the edge of that line, he was now on the side of good and catching those who would commit crimes. Red John inspired Patrick Jane in many ways, the point at which Red John’s crime spree crossed paths with Patrick Jane’s life was a turning point and while Red John may not have been captured, and may not have been changed, Patrick Jane was. To me, having that as the catalyst was enough. I did not need my damaged hero to go out on a path of vengeance and hatred. Nor did I desire to see Patrick commit crimes once more. Rather I enjoyed seeing him aspire to be someone his family could be proud of — and often achieve that goal. I enjoyed watching the redemption of Patrick Jane through his weekly actions with Lisbon (Robin Tunney) and her team. If Red John had never been a plot point again after the pilot, I would have been happy. If he had occasionally been mentioned as a piece of Patrick Jane’s back story that would have been enough for me as a viewer. Watching the featurette and discovering that the producers/writers/directors and powers that be of the show had always considered Red John to have a much more significant role to play in the show was a surprise to me. I had wondered over the course of the seasons when he would be woven back into the story if that had always been the plan or not, and the mythology of Red John answered a lot of questions for me. It also gave insight into the current roles of Cho (Tim Kang), Rigsby (Owain Yeoman) and Van Pelt (Amanda Righetti). I was particularly intrigued by the conversation pertaining to the passage of time between seasons 5 and 6. When I had heard the show would move forward 2 years I had wondered how the various characters would have spent the time, and as the episodes aired, and we saw how the lives of our cherished team members had unfolded each had taken a very satisfying path… well… okay… part of me felt Lisbon (Robin Tunney) was treading water, just waiting for the return of Patrick Jane (Simon Baker), but even that had felt in character. Mentalist is. at heart, a fun show. Patrick Jane is an irreverent character, with a fairly good understanding of the law and what the law enforcers can do, and yet he is constantly challenging them to try something unique, bend the rules just a tad and let him try something creative all in the name of capturing the bad guys, and make sure justice prevails. How can you not enjoy a man, with a child’s heart, and a con-man’s soul, who wants to do whatever it takes to see justice prevail? Season 6 of the Mentalist is currently available on DVD, and season 7 is scheduled to return to CBS in January. This entry was posted in Television and tagged Amanda Righetti, CBI, Cho, FBI, Kimball Cho, Lisbon, Mentalist, Owain Yeoman, Patrick Jane, Red John, Rigsby, Robin Tunney, Simon Baker, Tim Kang, Van Pelt on October 17, 2014 by Kay.